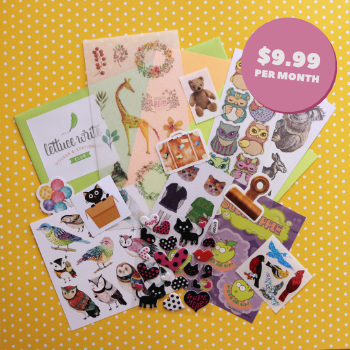 A sticker and stationery subscription box overflowing with hand picked goodies each month – what more could you want? We LOVE the old ways of communicating through writing letters and handmade cards. We love inspiring people to GET CREATIVE and have some good crafting fun. 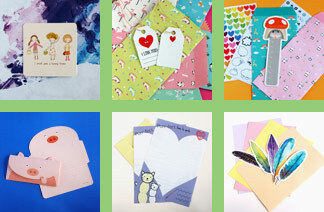 Who doesn’t love gorgeous stickers and stationery? These subscription boxes are available as a month-to-month payment (cancel at any time from your PayPal account) and are a great way to give a special gift to someone creative. Ready for the excitement of waiting for your sticker subscription to arrive every month and the joy of discovering all the goodies inside? Find a subscription box to suit you below! 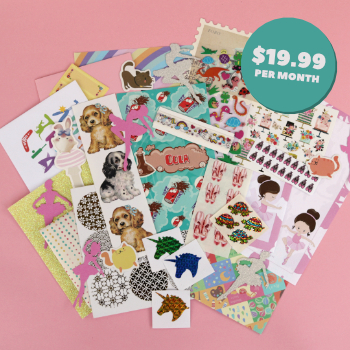 Our popular month-to-month sticker only subscription box. Sign up to receive your Lettuce Write “Baby Spinach” pack for as long as you decide! You can cancel or upgrade at anytime. This is the most popular subscription option. Sign up to receive your Lettuce Write pack monthly for as long as you decide! You can cancel this at anytime. Sign up for any monthly subscription and then cancel or suspend the subscription at any time in the future by logging into your account. It’s a simple and cost effective way to give a gift which spreads the joy, surprise and excitement over as many months as you choose! You can give a one off themed sticker and/or stationery pack from our growing collection of hand curated stationery sets.